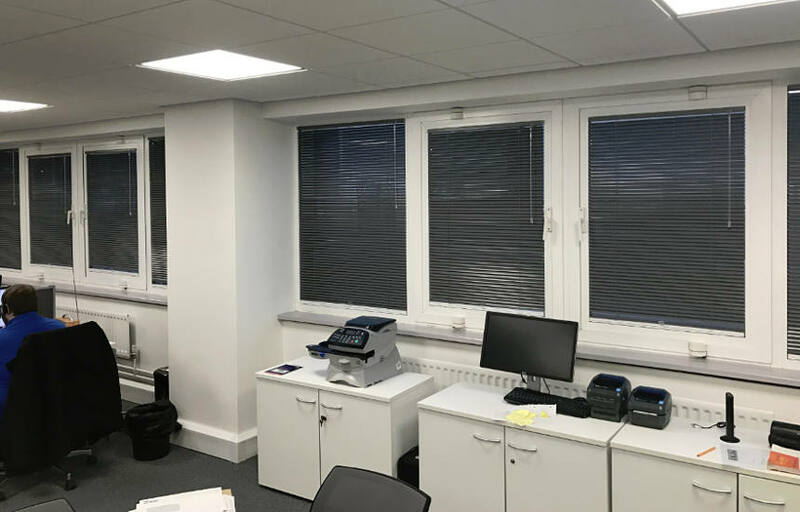 Moving to a new office, DLT Media in Woking invited us to help resolve a problem with the awkward windows in the office. Discussions went on finding out what the client wanted from the blinds. Solar block, visibility, light reduction, security and many other reasons the blinds were required. The conclusion was our “Tensioned micro Venetian blind”. This allows the window to be opened either as a tilt or side opener, visibility with solar protection during the day and night time security. Produced from aluminium slating, this commercial blinds system is tensioned using a cording system combined with springs concealed within the bottom rail producing a system that does not use a traditional method of cords to raise and lower, but a simple tab handle giving easy use and control. The client was impressed that such a system was so simple, neat and simply perfect for this situation.